The northern hemisphere summer constellation of Cygnus. Technical. This image was obtained with a Canon 1D Mark IV 16-megapixel digital camera, Sigma 35 mm f/1.4 DG HSM lens. This is a 13-frame stack made at ISO 1600 and f/1.4, 45 second exposures 9.75 minutes total exposure. The stars are a little too cyan in this image due to a slight drift in focus due to temperature changes. I threw out over half the frames due to this problem. The out of focus increased chromatic aberration too much to be corrected. CEFA = 60,600 minutes-cm2-arc-seconds2 (35.6 arc-seconds / pixel). 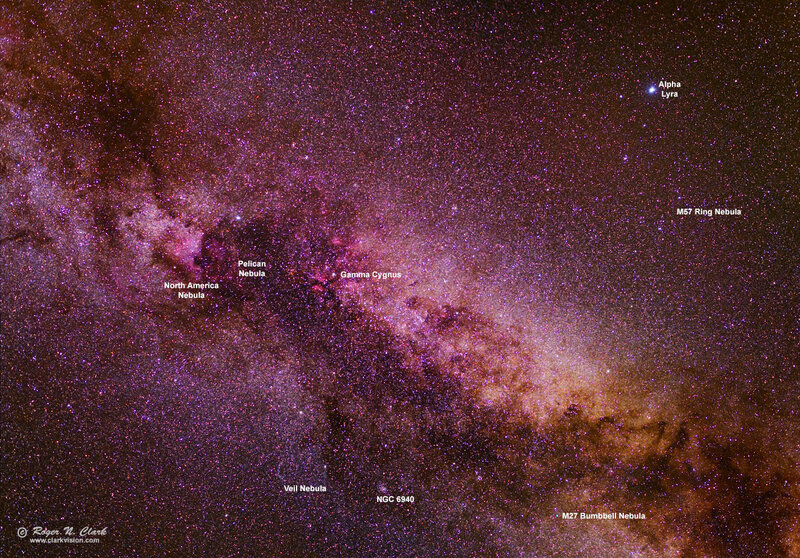 Higher resolution (1.2 MBytes, 1750 pixel wide) image: HERE. Modern DSLRs like the 1D Mark IV include on sensor dark current suppression and low fixed pattern noise at ISOs around 1600 and higher, making no need for dark frame subtraction. Modern raw converters correct for light fall-off and also correct for hot/dead/stuck pixels. This makes processing low light images easy: simply align and average. See my series on Astrophotography Image Processing for more details. The color balance is close to true color, meaning this is a stock camera with very close spectral response similar to the human eye. Astrophotographers often modify cameras for increased sensitivity to Hydrogen-alpha emission (red). Hydrogen emission nebulae actually appear pink due to H-alpha (red), H-beta (blue) and emission from other atoms, like oxygen and sulfur. Modified cameras over emphasize H-alpha, making hydrogen emission nebulae come out red in photos. Unmodified cameras do a better job at color separation of the various processes that occur in the deep sky.